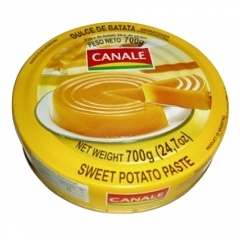 Home > Sweet Treats > Dulce de Batata / Sweet Potato Paste. 700gm. Dulce de batata (in Spanish: sweet potato candy, or: sweet potato jam) is a traditional Argentine, Paraguayan and Uruguayan dessert, which is made of sweet potatoes. It is a sweet jelly, which resembles a marmalade because of its hard texture. It is common to eat it with cheese.